Program Description: The online Professional M.A. in Higher Education is designed to serve the needs of those already employed at a college or university and who seek to advance their career in the administration of student affairs, student life, student services, and other positions in higher education. In just four regular semesters and two summer sessions, part-time students can earn the M.A. 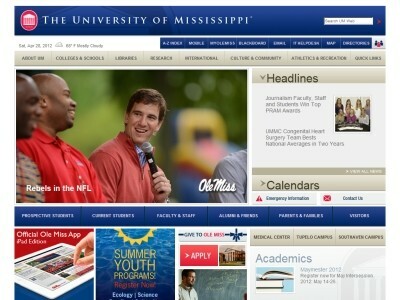 in Higher Education at the widely respected, historic University of Mississippi, affectionately known as Ole Miss. The online-delivered Professional M.A. program covers the same material as the on-campus program and is taught by the same full-time faculty. Graduates of the program are better able to advance their career ambitions in areas such as financial aid, student career planning, enrollment services and development, among many others. Courses are delivered in an online format - giving part-time students the most flexibility possible in order to fit coursework into both work and personal schedules. The program employs alternative methods of delivering course content, including Internet learning systems, audio/video conferencing and an assortment of streaming media content. In addition to the online delivery of coursework, there are two required on-campus residencies (at the beginning and near the end of the program) in Oxford in which students and faculty are able to interact. Students complete the online program as a cohort group with a high degree of collaboration, moving through the series of classes together. Accreditation: The School of Education is fully accredited by the National Council for the Accreditation of Teacher Education (NCATE) and by the Council for the Accreditation of Counseling and Related Educational Programs (CACREP). The School also holds accreditation with three specialized associations: •National Association of Schools of Art and Design (NASAD) •National Association of Schools of Music (NASM) •National Association of Schools of Theatre (NAST) Eligibility Requirements: Applicants to the online Professional Master of Arts in Higher Education/Student Personnel program must meet the following admission requirements: o Employed at a college/university. o Hold a bachelor's degree from a regionally accredited institution with an acceptable grade point average on undergraduate coursework. o A Graduate Record Examination (GRE) score indicating proficiency for graduate study. o Students admitted to the program must have access to high speed Internet.